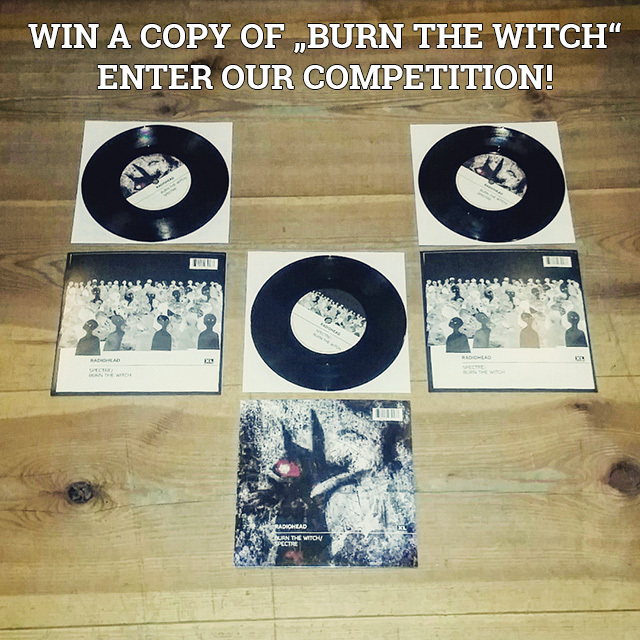 Win a copy of Radioheads "Burn the Witch" on 7"
The release of the 7″ „Burn The Witch“, the first of single of Radioheads upcoming album „Moon Shaped Pool“, has been pretty mysterious. We received loads of e-mails and calls plus enquiries from customers in the store, when the single will finally be available. Yesterday we got a little package with exactly three copies of the 7″. Since we don´t really know who was the first, second and third one who asked for the single, for reasons of fairness we decided not to sell the singles. Instead we set up a little competition! It´s quite fascinating that only 100 of the 2500 singles that have been pressed found their way to Germany. If you think about the number of record stores in this country, three copies are quite a lot. But enough said. 1. Be(come) a fan of Dodo Beach Recordstore. 3. Tell us in a comment, which is your favourite album by Radiohead. 1. Be(come) a follower of @dodobeachberlin. 2. Post a picture of your favourite Radiohead vinyl and tag/mention @dodobeachberlin in your post. 2. Tweet about your favourite Radiohead album and tag/mention @dodobeachberlin. All comments/pictures/tweets that fulfil these conditions and are posted until May, 27th 8pm CEST automatically enter the competition.